Leadership Coaching: Strategy. Adapting. Change. Performance. June 4, 2013 by Sue Mitchell, Aeona Limited. Abundant evidence shows that great leadership makes a difference both personally and to the organisation’s success and results in higher performance, productivity and profitability. Great leadership also leads to higher performance in the triple bottom line – organisational health, people’s engagement in the workplace, how much they commit to doing the best they can, having a positive culture at work, long term sustainability for the organisation and the sense of responsibility to the community and environment. It’s not just about work and making money, but also making the world a better place while you are doing it. I believe everyone is capable of being a leader and my purpose is to liberate the leader within each one of us. 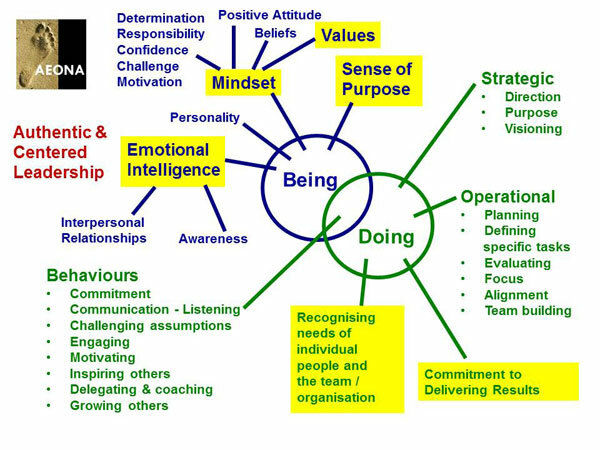 Leadership can be learnt and it is about mindset, behaviours and emotional intelligence. I am currently part of the team delivering a massive leadership development programme for a global company that’s based in UK. They are investing millions to secure their future sustainability and success through improving leadership at all levels throughout the company. I want to make leadership development more accessible for smaller businesses and organisations because I believe it will make a real difference. I’m offering discounted leadership programmes for women leaders and aspiring leaders in Scotland and for people in Midlothian and Edinburgh as many small businesses find it difficult to justify the spend. These programmes are eligible for FTO grant funding. Also, I think many business owners don’t see how leadership would be relevant to them. I often hear “well, I can see why it’s relevant in larger organisations but I just have a few people, we don’t need it…” I wonder how much this is due to not really appreciating the difference good leadership makes in groups of all types and sizes – whether it is a family, a business, a volunteer group or a multi-national organisation. I often encounter situations that resonate with my first experience of leadership. No-one ever thought to mention to me that leadership is something you can learn, that it even exists as a subject. I got a job leading an expedition to the South Pacific and my focus was entirely on the tasks required to deliver results and make it happen – logistics, planning, developing connections with relevant local people, designing the study projects, budgeting, raising sponsorship, etc. I ran a team building event, where we all met each other for the first time and it went down very well. If I ever thought about it, I assumed everyone was motivated for the same reasons I was and that what worked well for me would work well for them. How wrong I was! I’ve subsequently learnt that everyone brings their own perspective, own desires, own motivations, own personality and own ways of doing things to the table, and when you can recognise, understand, empathise and engage with all of that diversity, and connect their own meanings with the organisation’s purpose, then everyone will achieve tasks so much better, drive performance and have fun too. Leadership happens in our relationships with people and differs according to the different contexts and situations we find ourselves in. Yet how often are managers and other people in leadership positions focusing primarily on the tasks involved? How often do people end up in leadership positions or running small businesses because of their expertise and knowledge, but don’t get any training in leading and inspiring other people to do the work? How many people have created processes and ways of working for the team, company or business because that’s the way that worked successfully for them in the past? How much of your people’s skills, creativity, knowledge and capability remains untapped because you don’t know about it? How often do you take time to discover what motivates your people and tie this in with their work? How much more could your people be engaged at work and what difference could that make to your organisation’s performance? what difference would that make to how it feels to come in to work and to your company’s future? What difference would that make to your own future? August 3, 2011 by Sue Mitchell, Aeona Limited. Coaching is not a panacea or cure all. It is a tool which can be extraordinarily effective to achieve a purpose. Like all tools, it is effective when used skilfully and appropriately, recognising the appropriate fit for the purpose, when, where, how etc. • You are already using this thinking style so it feels like the coach is not bringing anything new or a new perspective. The value comes when a good coach makes a difference by asking deeper questions to push beyond the limit of your comfort zone, with the benefit that you gain new insights, such as to how to move forwards and/or achieve your goals. • You are already spending time to think about these issues, so you don’t value the time out of every day work to explore these issues with your coach. The value comes when your coach introduces a different perspective that you haven’t considered and uncovers assumptions you are not aware of – which are present more often than we realise as we get used to doing something the usual “way we do things round here”. • You don’t value being accountable to a coach to make the changes and you feel you would do these things anyway. The value of coaching comes when you recognise you probably would let some slide, or not stick to your timeframe as other tasks seem more important that those you just set for yourself. The benefit is you are more likely to do what you planned and achieve your goals, when you keep your coach updated on your progress. • You are looking for a consultant who will advise on the best way forward. The value of coaching comes when you recognise that you don’t need to be told what to do in this situation and you feel you will be more committed to doing things that you have identified and chosen to do yourself. • You are not comfortable at opening up and discussing issues close to your heart, that may be sensitive or things you would not usually discuss with anyone else. It may be because you don’t have the right coach with whom you can develop a relationship where you can comfortably discuss these issues, or it may be that you simply don’t like talking about it. In any case, it can be quite likely that the coaching will not get to the nub of the matter and address the underlying issues. Addressing only the surface manifestations is not as effective or long-lasting or transferable to different situations. The value of coaching comes when you invest time initially to find a good match with your coach so you can develop a good rapport. You also explore with your coach what it means to you to share these problems, or ask for help, if it doesn’t come naturally, and what would make it easier to talk about. You can choose to focus on one thing at a time so it doesn’t seem overwhelming and your coach can ask questions that will help you drill down to address the core issue. • You are not willing (consciously or subconsciously) to commit to the process and actually make the changes you discuss, reflect on what you do or complete actions. The value of coaching is when you make a conscious commitment to the process and explore with your coach to raise awareness of any barriers that you feel might get in the way. • You think (consciously or subconsciously) all this mumbo jumbo is not going to make a difference. You think real factual evidence and ‘task focused’ efforts are what counts. The value of coaching comes when you can acknowledge that thinking about deep personal issues is rather difficult and may take time, and it is ok that there are no right or wrong answers. You can also recognise that your feelings, values, and emotional state can be “factual evidence” about you. You recognise that being fully aware of who you are and how you feel is important as it influences how you make choices and decisions in your life and work. •	You find yourself being irritated or not engaged during coaching sessions, or perhaps rather ‘turned off’ by the language the coach uses. The value of coaching comes when you invest a bit of time and research upfront to find a coach who has an approach and style of coaching that you can relate to. There can, of course, be other reasons too. I speak with experience having been one of those people who didn’t value coaching, for some of these reasons, although I have subsequently come to value the experience of being coached and work now as a coach myself. I also hear and see all these examples in different combinations when talking with people about coaching, particularly those who have had a bad experience or have friends who didn’t get anything out of coaching. I often don’t take these people on for coaching as there is no point using the wrong tool when it won’t help someone achieve what they are looking for. It only ends in frustration and disillusionment. However, some of my clients have initially approached me believing that coaching doesn’t work, and I still took them on as they were willing to explore how to find the value as I have outlined above and came with an open mind, a desire to work with me and a commitment to their future. Many people find coaching provides real value when they take the time to find a good coach with whom they can work well. It is about finding a good fit so you can build a good relationship with your coach. Coaching isn’t a tool to force or coerce change. Coaching is a tool to facilitate a collaboration to unlock a person’s potential, clarify purpose and direction, unblock barriers, create new horizons, energise, motivate, challenge and support their commitment to achieve their purpose. When it goes well, coaching is fun and wholly energising. I love it and my clients love it and usually leave my session buzzing with enthusiasm, hope and commitment. It is contagious and gives me energy too and a sense of satisfaction as they achieve what they are looking for. May 24, 2011 by Sue Mitchell, Aeona Limited. Why do values make a difference? What happens if your boss or someone at work asks you to take short-cuts? Do you think this is a great idea and will save time and money? Do you think this will compromise your work or other issues you think are important, such as safety, health, legal regulations and so on? Do you feel able to say no or discuss it? Do you think your boss recognises the implications? Do you feel they just don’t get it? Do you feel your job may be under threat so you just need to go along with what you are asked? How stressed would you feel? Values play a fundamental role in how we perceive and interact with the world, how we interpret events and other peoples actions and behaviours. Its not always obvious. Our values and beliefs are often a sub-conscious filter through which we interpret everything around us and so play a fundamental role in how we respond – in our thoughts and behaviour. This sub-conscious influence sometimes leads to apparently irrational behaviour and decisions that are at best not constructive and often destructive or disastrous. We acquire our values and beliefs over our entire lifetime, accepting the ways of our culture, our parents, our teachers and others around us. They may have been extremely valuable at the time we took them on board, but sometimes they outlive their usefulness and lead to behaviour that is no longer helpful in our current situation. Time spent reflecting on knowing our values and beliefs and evaluating how useful they continue to be to us right now, is time well spent. Raising our conscious awareness of our values and beliefs gives us much more control over our personal thoughts and behaviour and makes us more aware of why we feel the way we do about a situation or person. It guides our choices and decision making at a conscious level and helps us to recognise when a choice does actually exist, even if the alternatives are somewhat unpalatable. We might recognise when our subconscious hijacks the decision making process when we feel there is only one way forward and no options. So how does this extend to a team or whole organisation? Jeremy Darroch, chief executive of BSkyB, gave three great examples at the recent Institute of Directors Annual Convention. Fostering the mindset “Believe in Better” has created a culture where everyone at BSkyB applies innovative thinking to everything they do every day, right across the business from product development to accounts. Maintaining a consistent value set and core beliefs guided Procter and Gamble to move quickly and grow sustainably from a small enterprise selling soap up the Ohio River to a global company. When values are a key component of strategy and are motivating – made real and alive from the executive team down, not just words on a page – they give people guidance in a way that rules and procedures alone do not. The strength comes from a clear value set that reaffirms the behaviour, actions and decisions made by all in the organisation. Getting everyone in the organisation involved and knowing how their role connects with the company success, focuses and guides everyone in one direction, even when facing new situations that rules and procedures do not (yet) cover. In contrast, consider Jeremy Darroch’s third example, the recent banking debacle – once people crossed the line beyond the rule book, they could and did go anywhere. In a rapidly changing world, consistent values and beliefs guide the way to sustainable success. Values and beliefs are a core component of Aeona’s new open programmes for leadership development. Please tell us what you think is important to include in a leadership development course or programme. Enter our short survey here and you could win £50 in Amazon Vouchers. Click through to our website for information on the short course, Inner Leadership, or 12 month Exceptional Leader Programme. Aeona: Coaching and Training for Leadership, Mental Toughness, Confidence and Careers. Sue is an experienced Executive Coach and trainer, who delivers Leadership Development, Personal Development and 1:1 coaching for people who want to excel, be the best they can be, or find new directions whether in work and career, and in life. Sue is based near Edinburgh and coaches in person in central Scotland, and by telephone and Skype with people all around the world.